Monday morning. The morning after my work's Christmas party. I needed eggs. Fast. 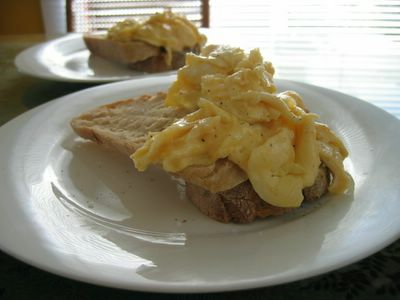 And there's no egg recipe more delicious than scrambled eggs, Bill Granger-style. 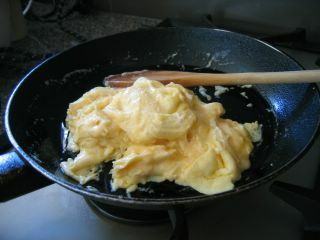 Mix together 4 eggs and as much cream as you dare, and cook in a bit of butter on a super-low heat, gently folding the eggs over as they cook. Make sure you take the eggs out of the pan before they are completely solid, as the eggs will continue to cook even once the heat is off. Now, this isn't Bill's exact recipe (refer to any of his books if you want exact measurements), but it's in the same style, and produces a fabulous breakfast. Mum and I ate this, on toast, whilst watching our tape of the finale of Prime Suspect: The Final Act. It was awesome! As were the eggs. I saw Prime Suspect: The Final Act a couple of weeks ago. I am so sad it's all over. :( I'm a BIG Jane Tennyson fan! The eggs looks scrummy, and at 10:19am, I am looking at these and my stomach is grumbling! Yum! You really do love Bill, don't you! I just made some Corncakes which are similar to Bills, I think. I've been reading your blog for the last few weeks and loving it, I'm even thinking about doing a similar project to your Nigella one, but maybe not quite as many recipes. Well done!